Rowman & Littlefield Publishers, 9781442239227, 280pp. 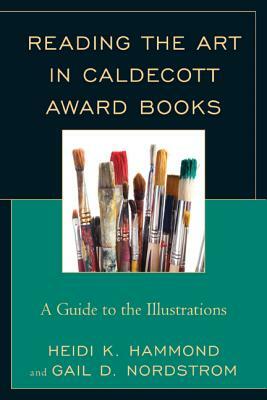 Reading the Art in Caldecott Award Books is a practical and easy-to-use reference handbook explaining what makes the art in Caldecott Medal and Honor books distinguished. It is a useful manual for librarians, teachers, and others who want to better understand picture book illustration. This book includes many useful components: -Short entries about fifty-six books -Information on styles and media -Artistic analysis of the illustrations -Appendixes on selected sources for further reading, Randolph Caldecott Medal terms and criteria, bibliography of entries, and a list of Caldecott winners -Glossary of art terms - Indexes of author-illustrator-title, media, and style This book, used as a handbook in conjunction with Caldecott Award books, provides readers with ready-to-use information they can share with children and others, while helping to build confidence in one's ability to talk about art in all picture books. Heidi Hammond, Ph.D has 23 years experience as a school librarian at the elementary, middle, and high school levels, and coordinates the school library media specialist portion of the MLIS program at St. Catherine University in St. Paul, Minnesota. Hammond served on the 2011 Randolph Caldecott Award Committee (Association for Library Service to Children) that selected A Sick Day for Amos McGee. She was a member of the 2013 Margaret A. Edwards Award Committee (Young Adult Library Services Association) that selected Tamora Pierce. She has also served on the editorial board of SLR-School Library Research (American Association of School Librarians). Gail Nordstrom, M.L.I.S. rediscovered the power and delight of children's books as a youth services librarian for Stillwater (Minnesota) Public Library, where she worked with children, teens, and caregivers for nineteen years. She is currently the public library consultant for Viking Library System in west central Minnesota. She continues to share her enthusiasm for children's literature in workshops and conferences in the state. Nordstrom on the 2011 Randolph Caldecott Award Committee (Association for Library Service to Children) that selected A Sick Day for Amos McGee. She was also a member of the 2002 John Newbery Award Committee (ALSC) that selected A Single Shard. She has organized local Newbery and Caldecott mock discussions for librarians and teachers since 1997. Gail has served as judge for the Minnesota Book Awards and is a member of the Maud Hart Lovelace Book Award Selection Committee.